In the past year or so, there have been at least half a dozen exhibitions relating to textiles in museums and galleries across Europe – from Soft Pictures at the Museum Re Rebaudengo in Turin and Decorum at the Musée d’Art Moderne in Paris to Art & Textile at the Kunstmuseum Wolfsburg and An Open Letter at the Museum Abteiberg in Mönchengladbach. 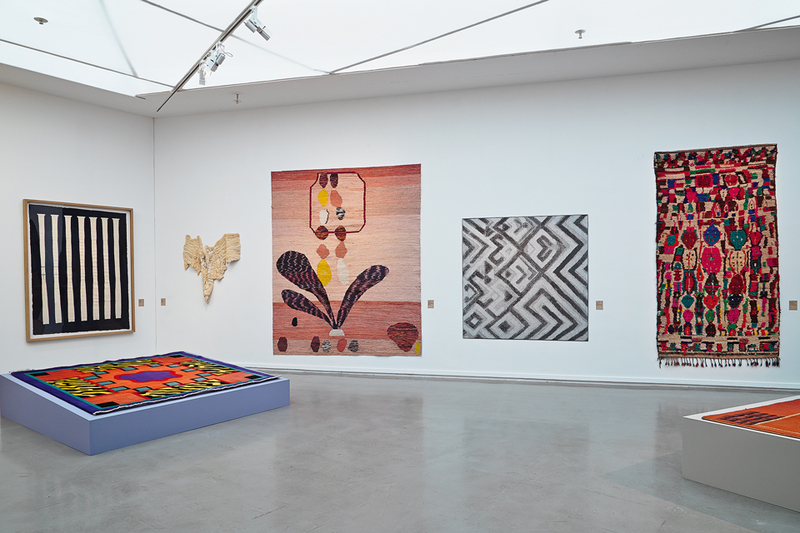 While each approached the subject from a different angle – the meeting of the pictorial and the tactile in Soft Pictures, the legacy of tapestry as an art form in Decorum, or the conceptual implications of the woven structure in Open Letter – all attempted to get to grips with the surge of textiles in contemporary art and elucidate its relation to the past. Installation view of Decorum, Musée d’Art Moderne de la Ville de Paris, October 2013. Why this fascination now? Is it, as Richard Tuttle once stated, because ‘weaving has a certain cast of the future’? Tuttle himself has a deep and ongoing involvement, both as a collector of textiles from around the world, and as an artist for whom cloth in various forms has been a vital material, medium and matter of interrogation. His recent exhibition at the Whitechapel Gallery and his ongoing project in Tate Modern’s Turbine Hall is titled I Don’t Know . The Weave of Textile Language, intimating not only the inconclusive nature of the vast subject, but also the notion of textiles as a constructed, complex, languagelike form. This enigmatic quality is partly due to ubiquity. ‘Everybody in this room is wearing a textile,’ said Tuttle in a recent interview, ‘but it’s put in a zone where you could call it invisible.’ Textiles may be taken for granted, but when under the spotlight they speak of human bodies and quotidian needs and provide an unbroken link to civilisations remote in time and place. The mechanical process of weaving, meanwhile, describes the present moment – it becomes, through its own manufacture, an embodiment of time itself, whether the accelerated speed of industrial production, or the deliberate pace of handmade cloth. Whether unique artefacts, or industrially produced, textiles are evidence of socio-political history. Their often domestic usages voice deeply inscribed gender divisions; ideas of ‘women’s work’ which are not yet obsolete. They straddle the boundaries between applied and fine art, while refusing to commit to either entirely. Textile language, therefore, is a many-voiced cacophony that, as the kinds of works being made by contemporary artists prove, shows no signs of either exhaustion or obsolescence. Is one reason for the current appeal down to our increasing reliance on technological tools and screen-based experience? Do the tactile pleasures of cloth and fibre provide an antidote to the lack of haptic stimulations in an increasingly digitised, image-saturated reality? New York-based, London-born artist Nick Relph’s exhibition at the Chisenhale Gallery in October 2013 suggested this to be the case. Film had previously been his primary medium, from early collaborations with artist Oliver Payne to more recent solo works such as 2010’s cumbersomely titled Thre Stryppis Quhite Upon ane Blak Field (a convoluted intertwining of the history of tartan, the work of Japanese fashion label Comme des Garçons and Ellsworth Kelly’s monochrome artworks). The Chisenhale show, however, consisted almost entirely of hand-woven panels: an array of vivid, labour-intensive surfaces woven from polyester, silks, rayon, latex and paper. As surprising as it seemed for Relph suddenly to adopt the four-harness floor loom as his tool of preference, his approach has been consistently research-orientated, investigating the social history and latent meanings behind the material surfaces around us that we take for granted. 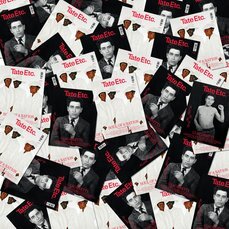 ‘A white T-shirt… just any kind of fabric to me is psychedelic,’ he says, referring to the tangle of factors that go to make up all textiles, whether homemade or industrially produced. As such, his woven panels suggested a homespun extrapolation of the history and labour inherent in the medium, while offering a haptic analogy of the multilayered internet portals that serve to fracture our daily routines. Similar occluded systems of reference are at the root of weavings by the Dutch artist Willem de Rooij, who also came to this medium via filmmaking. 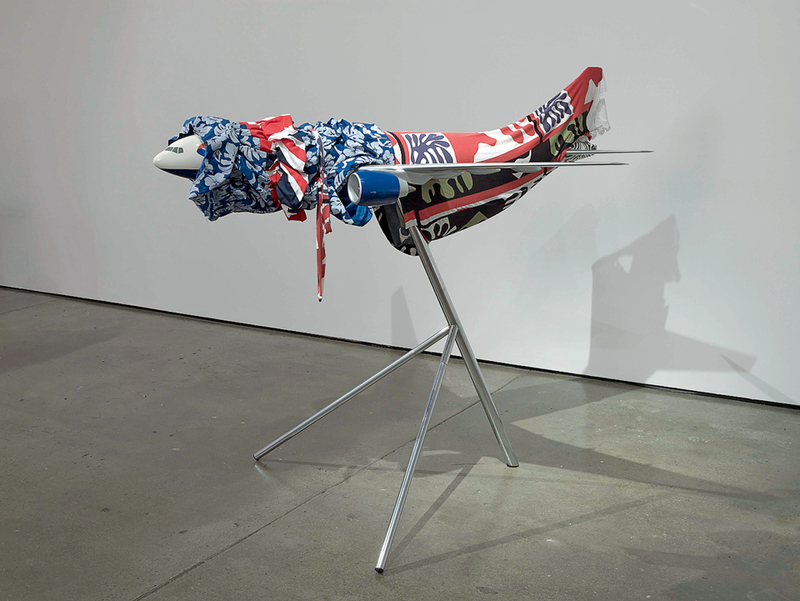 Though his slickly glamorous machine-woven panels such as Vertigo’s Doll 2010 have none of the homemade appeal of Relph’s works, they articulate similar concerns, both proposing the panel as a form of surrogate image and drawing attention to the colonial histories entwined in textile production. 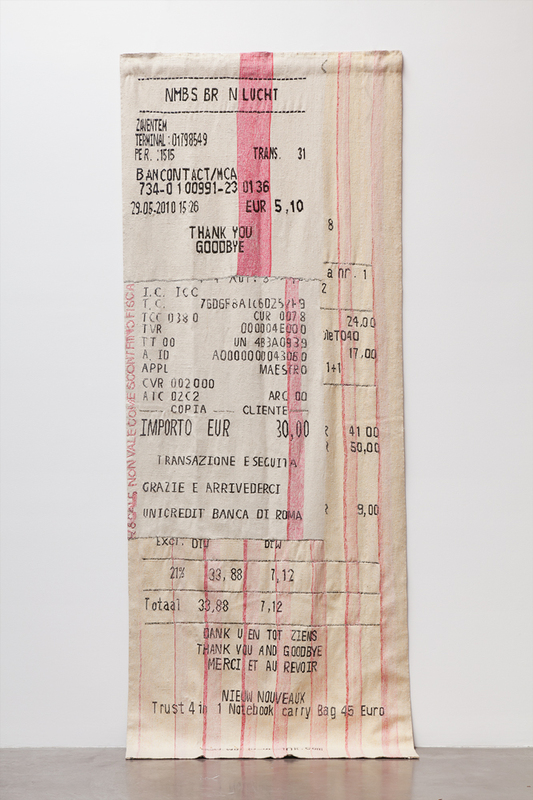 American Pae White and Mexican Gabriel Kuri both draw on the possibilities of digital weaving technology to create richly illusionistic tapestries picturing the ephemeral (White’s tapestries of swirling smoke) or quotidian (Kuri’s woven renderings of shop receipts: an everyday existence expressed through commercial transaction and commodity). 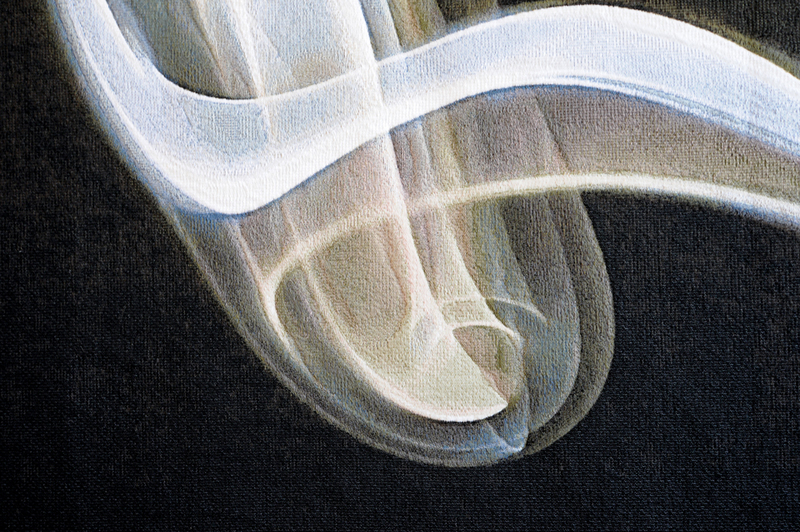 Even Gerhard Richter has been tempted to indulge in the wizardry afforded by digital imaging techniques applied to textiles, mirroring one of his abstract squeegee works fourfold before reproducing it as a woven jacquard tapestry (Abdu 2009). As these various works suggest, there is no clear distinction to be made between the digitisation of our everyday lives and the role textiles play within that. The production of textiles is rarely a solitary affair, with its workshop-like activity attracting artists such as Lucy McKenzie, whose collaborations with designer Beca Lipscombe under the moniker Atelier EB encompass fashion design, textiles, furniture and publishing. Positioning themselves consciously on the borderline between applied and fine arts, their project sets out to contaminate both, by examining the commercial realities of production and distribution, but exhibiting the results in an art context. Atelier EB is an extension of McKenzie’s independent practice, which itself operates on the boundaries of what is generally considered to be fine art, taking in performance, fashion and graphics and engaging labour-intensive techniques such as the art of trompe l’oeil painting in which she recently trained at the renowned École Van Der Kelen in Brussels. French-born, London-based Marc Camille Chaimowicz, an artist with whom McKenzie has collaborated several times over the past few years, was already dabbling in these grey areas between fine and applied arts in the mid-1970s when he began making hand-painted wallpaper, textile designs and pieces of furniture in what he deemed a series of ‘home improvements’. As a male artist working in the early years of second-wave feminism, this also placed him in a grey area in terms of gender: such domestically located activities were still considered a female domain, as opposed to the production of discrete objects of fine art. In Chaimowicz’s radical practice, these boundaries were stepped over, or perhaps rather expanded to become an inhabitable territory of their own, in which divisions between art-making and everyday life, or between one gender and another, were no longer clear-cut, and textiles were utilised as a medium of agitation. He formalised his interest in the early 1980s, travelling to Lyon and becoming apprenticed in the textile industry to learn techniques of printing on silk and cotton. Chaimowicz was the artistic director of the recent Decorum exhibition, a tour de force of more than 100 tapestries installed in a series of theatrical mises en scène that abandoned chronology in favour of thematic groupings. In a gesture typical of his provocative desire to create a total, immersive experience, carefully chosen props were added to the display – a dial telephone left off the hook, a silk negligee flung over a freestanding screen, or a lily lying on a carpet – while a soundtrack of ambient ‘furnishing music’ was supplied by philosopher and sound artist Jean-Philippe Antoine. Some of the most striking pieces in Decorum and other recent textiles shows were by practitioners of so-called fibre art from the late 1960s and early 1970s. 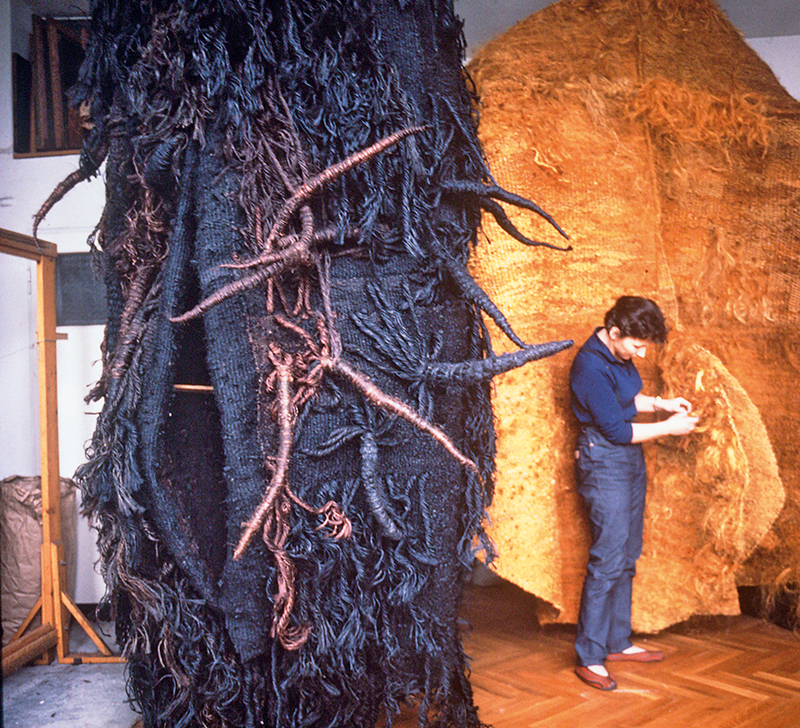 Works such as Polish artist Magdalena Abakanowicz’s Abakans 1966–75: enormous organic three-dimensional structures in natural fibres such as sisal rope, flax, jute and horsehair, in deep red or orange hues, that lead weaving away from the rigid framework of the loom to create spatial environments of their own. Abakanowicz was included in Wall Hangings in 1969, the first major show at MoMA devoted to ‘the contemporary weaver whose work places him [sic] not in the fabric industry but in the world of art’. Unusually for a museum exhibition of that time, of the 28 artists featured, only a handful were male. The display concentrated on the constructive potential of weaving, rather than its pictorial qualities, and so aligned it with some of the spatial experiments being undertaken by other artists in areas such as land art, minimalism and some forms of conceptual art. Among those was Tuttle, who had begun to make a variety of irregular-shaped canvases that intended to simultaneously suggest a drawing of a three-dimensional structure in space while exploring the material employed. American artist Sheila Hicks originally trained as a painter under Josef Albers at Yale, but was drawn to weaving during a scholarship in Chile. 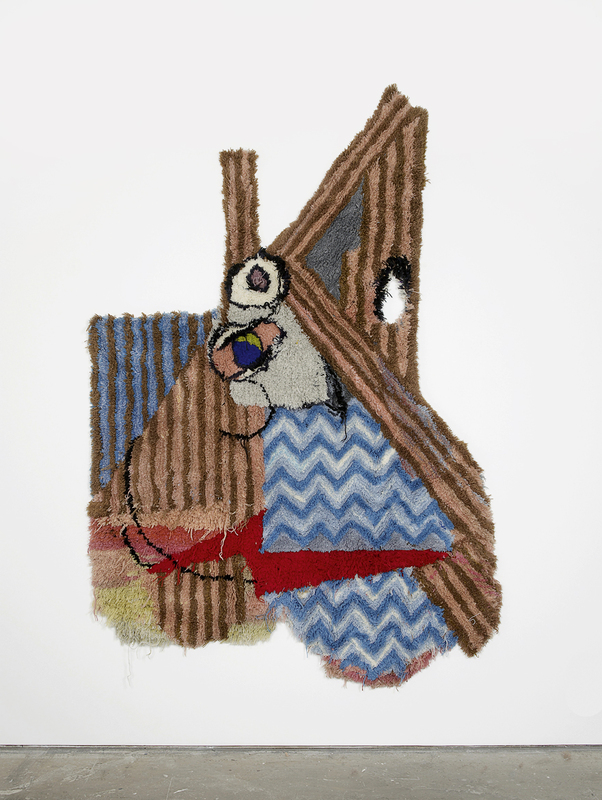 Her Evolving Tapestry 1967–8, which was shown in Wall Hangings, used thread as a loose, linear element, not intermeshed to produce a plane but rather massed to create a three-dimensional volume. 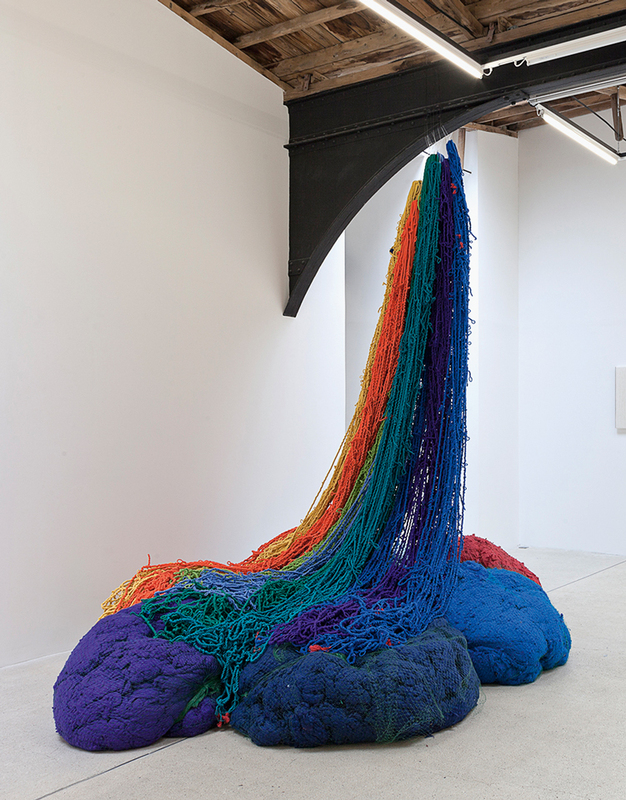 Hicks and Abakanowicz were among the most renowned of the fibre artists, exhibiting frequently from the 1960s onwards, and their works can now be found in the collections of institutions such as MoMA and Tate. Others were not so fortunate. 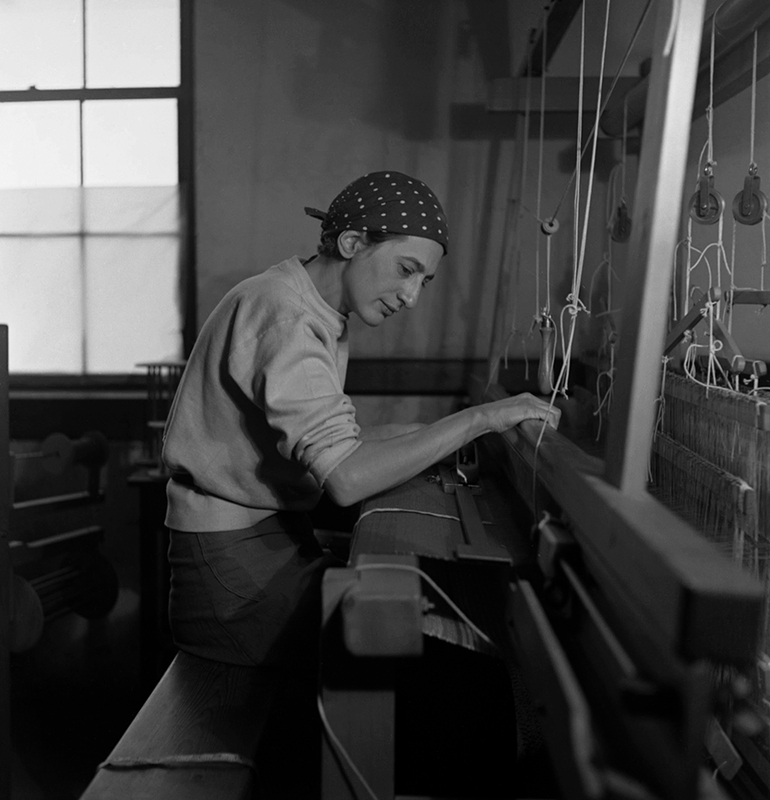 German Sofie Dawo, who undertook a similarly rigorous analysis of the potential of fibre as a medium while teaching at the Academy for Arts and Crafts in Saarbrücken from 1959 to 1992, received little recognition for her ground-breaking works during her lifetime, beyond the specific forum of the International Tapestry Biennials that were held in Lausanne from 1962 to 1995. Her art was a highlight in the spate of recent textile exhibitions in Germany, but sadly a posthumous one, as she died in 2010 at the age of 84. Such resistance can be traced in the works of German artist Rosemarie Trockel, who was an early proponent of the integration of textiles into a wide-ranging art practice, having begun in the mid-1980s to make ‘knitted pictures’, machinemade panels of knitted wool, monochromatic or incorporating well-known symbols, as a comment on male modernist tropes and conceptual posturing. Now that textiles are moving out of the gender-relegated sidelines, as evidenced by the number of younger male artists embracing this medium, whether Relph or de Rooij, or German Michael Beutler, whose enormous hand-built loom, spewing great rolls of hand-made carpet, could be seen in Decorum, the resistance they suggest is angled rather towards broader cultural or socio-historical hegemonies. Richard Tuttle has described his aim to be ‘to make an art that satisfies, or helps other people in their daily pursuit of interfacing culture and civilisation’. Textiles seem to be uniquely positioned to perform this subtle interfacing. Kirsty Bell is a writer who lives in Berlin. Her recent book The Artist’s House is published by Sternberg Press.